If you are looking for information about the songs and music used and featured on the television series Better Call Saul on AMC, then you have come to the right place. Below is a compilation of the tracks and pieces of music that had the privilege to grace one of the best television shows of 2015/2016. Several months before the premiere of the show, a music video teaser was released by the creators of the show. It was simply titled the Better Call Saul song and you can listen to it here. It's performed by the country music singer Junior Brown. The music for it was composed by Dave Porter and Adam Dornblum. 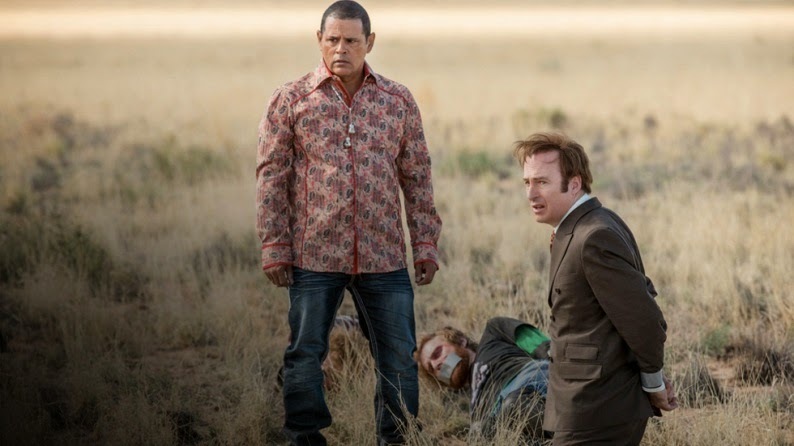 And the lyrics were written by Vince Gilligan and Peter Gould (the creators and producers of the show. And here are the songs used in the episodes of the show. The tracks and pieces of music are listed under the episodes they appeared in. 1) Address Unknown by The Ink Spots - This is the song playing in the very beginning of the episode. 2) Concerto for Strings in G 'Alla Rustica' 1. Presto by Vivaldi - This version of the composition was especially created for Better Call Saul. 1) It Came Out Of The Sky by Creedence Clearwater Revival - Mike was opening the door of a parked police car in front of a bar. 2) Hold On Loosely by 38 Special - The bar scene with Mike having a drink then talking with the two cops whom he suspected were the killers of his son Matt. 1) Tune Down by Chris Joss - The scene when Mike stole the money from the home of the Kettlemans. 1) Coffee Cold by Galt MacDermot - As Jimmy puts together the shredded paperwork he took from a dumpster. 1) Season of the Witch by Al Kooper, Mike Bloomfield, and Stephen Stills - As Jimmy returns to the bar in Chicago and reunites with his old buddy Marco. 2) Smoke on the Water by Deep Purple - As Jimmy drives away at the end of the episode. 3) Mercy, Mercy, Mercy by The Buckinghams - The opening scene at the bar. 4) Polk Salad Annie by Tony Joe White - The opening scene at the bar. 5) Banzai Pipeline by Henry Mancini and his orchestra - The montage of Jimmy and Marco doing their scams. 1) Funny How Time Slips Away by Billy Walker - The opening scene which was shot in black and white at the Cinnabon bread store. Written by Willie Nelson, the song was first recorded and released in 1961 by country singer Billy Walker. 2) Smoke on the Water by Deep Purple - Jimmy was humming the guitar riff inside of his car as he drives away from the court house. 3) Buona Estate by 5 Alarm Music - As Jimmy drinks some of the cucumber water at the nail saloon where Jimmy's office is located. 4) Buena Vista by The Shiffers - At the pool and hotel bar as Jimmy and Kim sit down for a talk and a round of drinks. 5) All That We Perceive by Thievery Corporation - At the bar in the hotel while Jimmy and Kim were seated at a table and then they hear Ken at the bar side talking to his bluetooth headseat. 6) Transatlantic by Quantic - As Jimmy and Kim approach Ken at the bar to ask him more information about investing in stocks. 7) Golddigger by Supreme Beings of Leisure - At a booth inside the hotel bar as Kim, Jimmy, and Ken dine and drink while talking about their stock investment plans. 8) Music and Wine (The Atta Boy Vocal) by Blue Six - At the pool outside of the hotel bar after Jimmy and Kim leave Ken. 9) Wishing Ain't No Sin by Billy Momo - The instrumental music playing in the background during the recap at the beginning of the first episode of season two.